In September 2014, some of the first cohort of the Goldsmiths MA in Visual Sociology organised an exhibition of work produced over the year. Rose Delcour-Min, Ali Eisa, Katie Knapp, Roz Mortimer and Marina da Silva wrote up their reflections on the exhibition, and the MA more generally, for the International Visual Sociology Association newsletter. ‘Having initially explored more tentative titles such as Is This Visual Sociology?, and after a year of study in the first Masters programme in Visual Sociology, our confidence in our inventive and sensory methods led us to a bolder statement: This Is Visual Sociology. Engaging Tactics @ the BSA Annual Conference 2013 in London, Wednesday April 3rd. Engaging Tactics is a Goldsmiths PhD initiative exploring the boundaries between sociology and life through multi-sensory, multi-site engagement with publics and participants inside and outside of academia. A series of interventions and round table will continue the discussion during this years the BSA Annual conference. With: Noortje Marres, Nirmal Puwar, Alison Rooke and Michel Guggenheim (all of Goldsmiths, University of London). Chaired by Anna Bull and Christian v. Wissel. 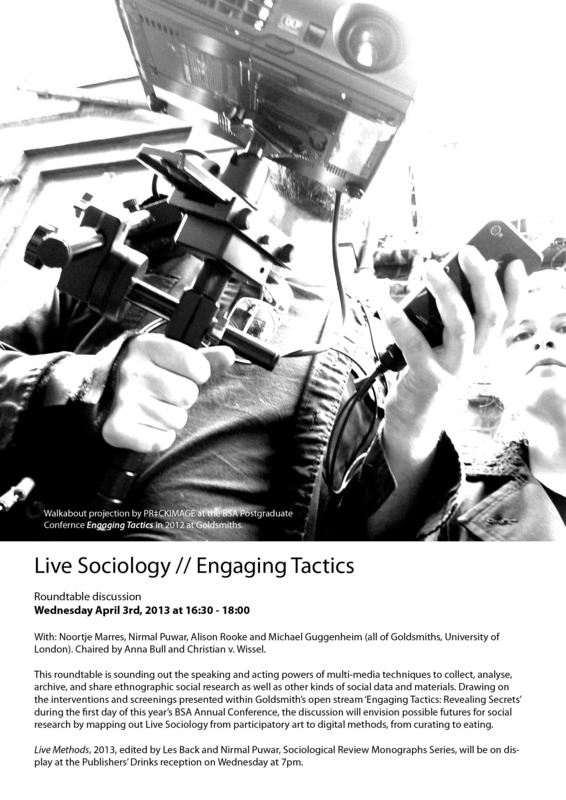 This roundtable is sounding out the speaking and acting powers of multi-media techniques to collect, analyse, archive, and share ethnographic social research as well as other kinds of social data and materials. Drawing on the interventions and screenings presented within Goldsmith’s open stream ‘Engaging Tactics: Revealing Secrets’ during the first day of this year’s BSA Annual Conference, the discussion will envision possible futures for social research by mapping out Live Sociology from participatory art to digital methods, from curating to eating. Live Methods, 2013, edited by Les Back and Nirmal Puwar, Sociological Review Monographs Series, will be on display during the Publishers’ reception at 7pm. The venue for the 2013 BSA conference is the grandly mysterious Connaught Rooms, owned by the Freemasons, complete with masonic stars on door handles and secret entrances into the Masonic Lodge next door. ‘Off-the-records,’ in adjacent rooms and (almost) concealed interventions to the conference, Engaging Tactics therefore showcases a sound performance and video screenings that search for ways to talk about and engage with those bodies and lives that keep or are kept away from public. 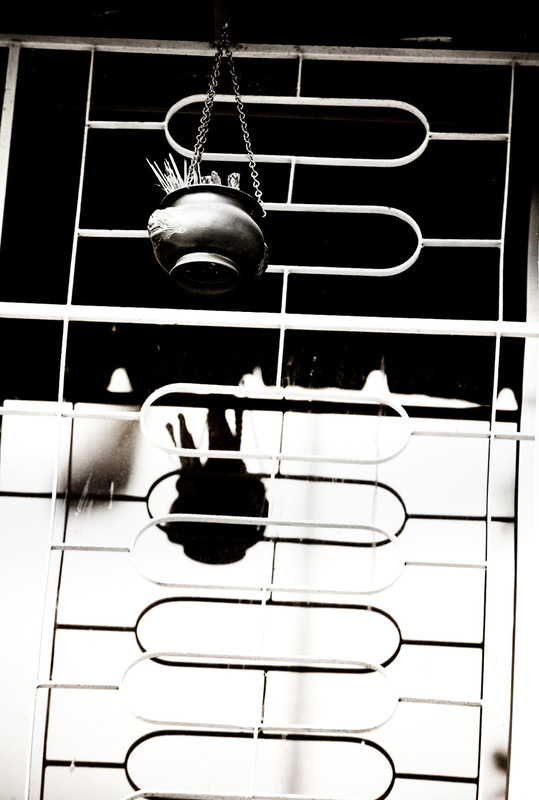 Tansy Spinks: sound artist, lecturer at Middlesex University and Camberwell College of Art. The sound performance Sonic Ritual (equivalent) will play with ideas about secret rituals, using objects and the sounds they make, through microphones, live loops and loudspeakers. 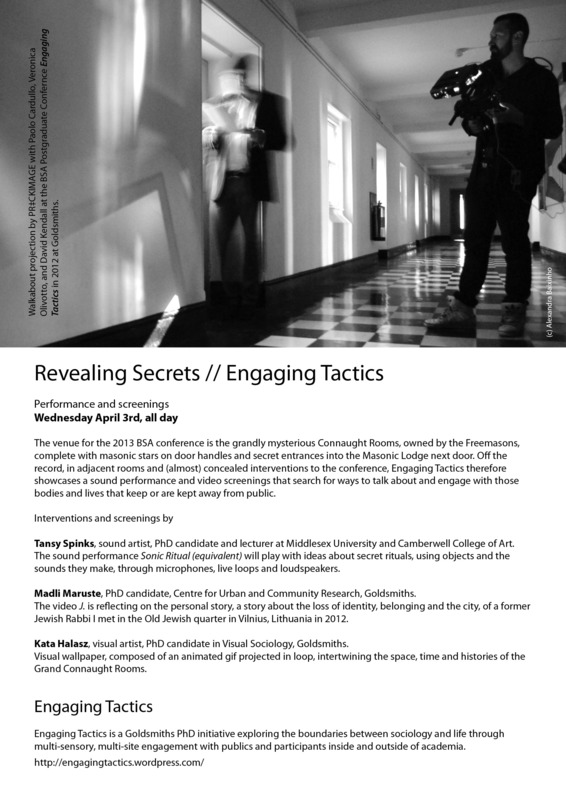 Madli Maruste: PhD candidate, Centre for Urban and Community Research, Goldsmiths. The video J. is reflecting on the personal story, a story about the loss of identity, belonging and the city, of a former Jewish Rabbi I met in the Old Jewish quarter in Vilnius, Lithuania in 2012. Kata Halasz: visual artist, PhD candidate in Visual Sociology, Goldsmiths. Visual wallpaper, composed of an animated gif projected in loop, intertwining the space, time and histories of the Grand Connaught Rooms. Working in the emerging fields of Visual and Sensory Sociology implies searching for ways by which visual and sensory research tools and findings can make an intervention in the production of public knowledge. This is, that the visual and sensory means applied during research become productive not just as inspiration, companion or appendix to the written piece, but productive in their own right and speaking their own language. Visual and sensory knowledge – or more generally speaking: creative knowledge – are specific ways of knowing, different to that of intellectual abstraction to which they tend to resist when caught and translated into textual description and interpretation. It is in this light that the practice of curating acquires heightened importance. Curating Research is about handling research (Bolt 2010). It is about listening to and bringing into relation the visual and material qualities inherent in those forms of research that draw on, or develop through, artistic practices. And it is about exploring “curating as a research process” (Wells 2007) that in itself allows sociological enquiry – in all its possible forms, visual-sensory or not – to re-imagine, re-arrange, experiment with and expand its methods and ways of communication (see Puwar and Sharma, “Curating Sociology”, forthcoming). Thus, if Visual and Sensory Sociology claim to be able to find distinctive approaches into researching the social, they have to find ways how to recognize, maintain and make flourish the uniqueness of such visual-material (creative) knowledge when introducing it into the ‘conventional’ channels of knowledge production in the social sciences. Curating Research shows the potential to be such a way. The medium ‘exhibition’, as a space, way of doing and a set of tools for research, can expand our means by which to challenge the material and sensory relations of the social. And it can help us to engage with publics inside and outside academia by using “other ways of telling” (ibid.). Curating the city and Curating Research are two interventions that aim at contributing to find such ways. The first being an exhibition about the making of an exhibition and the second being a public talk about the art of exhibition making, both events invite to discuss the possible tools and spaces offered by curatorial practices in order to access, present, put to work and challenge creative research and knowledge. please have a look and join the discussion. 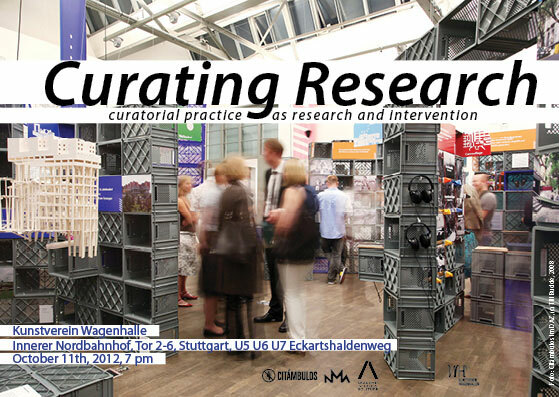 Curating Research aims at exploring curatorial praxis as the means and stage for artistic research in the social sciences. The public talk asks about the politics and ethics of exhibiting as well as about the possibilities provided by the communication medium ‘exhibition’ to open up new, or different, spaces for thought and action. As a reference point for the discussion we will draw special – yet not exclusive –attention to the tools and techniques inherent to curatorial practices in the field of critical urban studies. What possibilities emerge through the medium ‘exhibition’ for investigating, thinking, and changing the city? 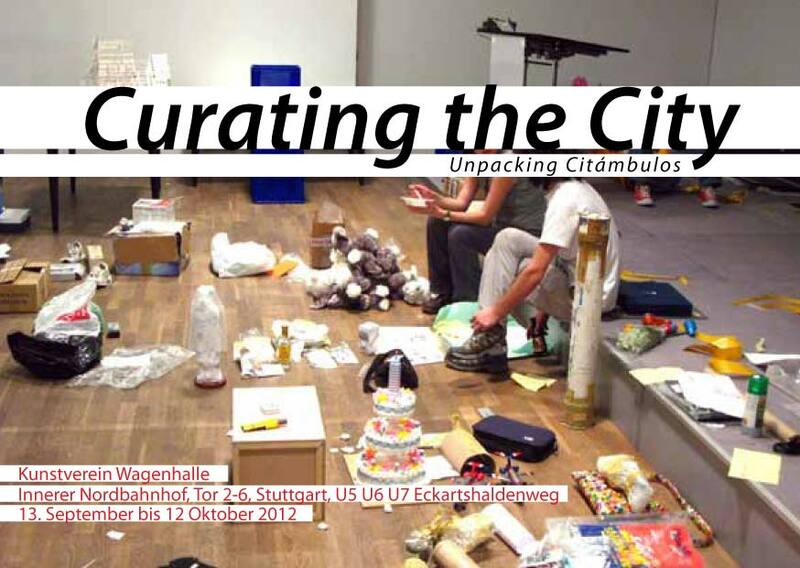 Curating Research is an initiative by the urban research collective Citámbulos, the architecture collective NMA and Akademie Schloss Solitude. It takes the exhibition Curating the City – an exhibition about curating an exhibition about Mexico City – as an opportunity and spacial-haptic starting point for the discussion. The public event invites curators, exhibition visitors, social scientists, and all those, who use artistic resources for their research, to reflect on their curatorial tools. It aims at exploring ways in which exhibitions and artistic knowledge production can become methodically firm and critically productive means for intervening in society. Curating the City addresses the question of how curatorial practice and exhibition space can operate as active thinking spaces within urban research. The exhibition is designed as an open archive and workshop conversation with the interdisciplinary urban research collective Citámbulos whose homonymous project on urban phenomena in Mexico City has been shown in Berlin, Mexico City and Copenhagen (among others) in recent years. By means of a dialogue between specific exhibition pieces, excerpts from the publication Citámbulos: Guide to the Marvels of Mexico City and the collective’s Manifesto, Curating the City invites reflecting on ‘the art of listening’, ‘imagination as method’ and ‘remarking the unremarkable’ of our cities. Anyone interested in presenting a paper should submit an abstract on-line to http://www.isa-sociology.org/buenos-aires-2012. UCL and The Royal Geographical Society, London. Recent years have seen a renewed engagement with the empirical, witnessing the emergence of research methods and dissemination activities that critically engage theory and practice in new and exciting ways. These vibrant approaches have included: participatory and action research methods; performative and non-representational work; engaging with more-than-human entities; forms of creative address; as well as interdisciplinary and beyond-the-academy working practices. Yet undertaking this kind of research has, arguably, created a shift in the form and nature of the empirical, leading to a series of challenges surrounding how we make sense of, work with, and write about, these contemporary forms and expanded volumes of qualitative and quantitative data. This workshop aims to bring together post-graduates and early career researchers from across social and cultural geography to engage with ideas of the empirical and to address some of the issues and challenges of research in this contemporary context. If you don’t know Mark Fisher, it would not be easy to introduce his work as they encompasses a wide range of subjects. I know him as a Lacanian psychoanalyst. He is a practicing member of NLS (New Lacanian School). His latest publication by Zero Books, Capitalist Realism, discusses the appropriated capitalist concept of “reality” as one and only through examining media, films and public domain. Apparently, he is a visiting lecturer at our college. I think it would be nice if we could organize a talk by him. He is giving a talk at Chisenhale Gallery on Wednesday 17 November at 7pm entitled “Can anything genuinely new emerge in a political landscape that is clogged with ideological junk?” I think this would be interesting for those of us who are concerned with researching, exploring and creating an alternative horizon, the one that could not be appropriated and absorbed by current political, social and cultural order. If you are interested in challenging, come along to the talk. I contacted the gallery, booking is not required just make sure you come early to have a seat.